My research performed at the NEST Laboratory is mainly focused on the nanofabrication and spectroscopic study of arrays of quantum dots (QD) in heterostructures with two-dimensional electron gas (2DEG) confined in GaAs / AlGaAs quantum wells. Arrays of QDs have been nanofabricated in square configuration or different spatial distributions, varied in order to assess the impact of the geometry in these artificial lattices by optical spectroscopy. This activity has developed concerning also the realization of photonic cavities in which to integrate an individual QD, in order to find a way to enhance its optical response as a result of excitation with laser radiation. The experimental activity has developed in parallel for what concerns the realization and the spectroscopy of both the photonic cavities and the QD matrices. Replicas of square QD matrices with lateral dimension 0.1mm were nanofabricated, each characterized by a different density of QD, i.e. containing a number from 40000 to about 1100. Each QD has a diameter of about 320nm and aspect ratio of about 2/5. These nanostructured samples, housed in the cryostat available in the NEST laboratory and maintained at the temperature of liquid helium, have been studied by Raman spectroscopy. 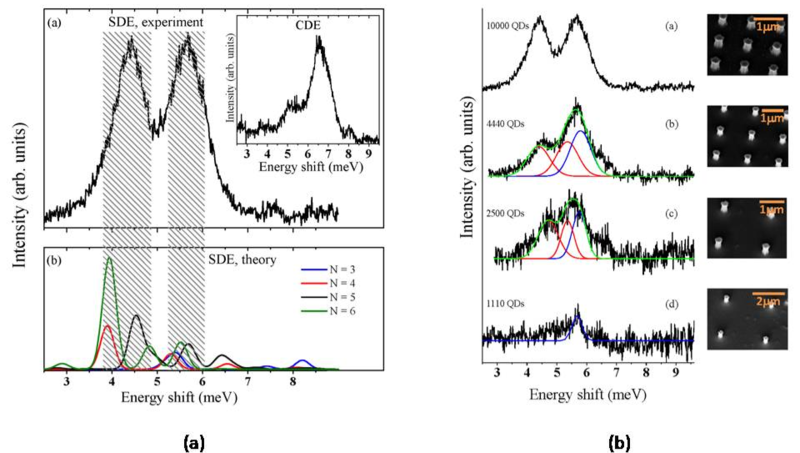 Substantial differences in the photoluminescence (PL) spectra and collective excitations of electrons confined in the QD when the laser is focused on matrices with different density have been measured. The comparison of the experimental spectra with the results of theoretical simulations (“Configuration – Interaction” analysis) conducted by Dr. Rontani at the center NANO S3-CNR in Modena, showed that it was possible to identify and isolate the individual contributions produced by different populations of electrons confined in QDs. The analysis led to the identification of the main contribution from populations 3 or 4 electrons. This trend is shown by the graphs presented in figure. In the more diluted array, only the peak related to the presence of the population formed by three electrons survives. Concerning the photonic cavities, it was first addressed the critical issue to grant the matching of the photonic mode supported by the cavity with the frequency of the signal emitted by a single QD. This is mandatory in order to obtain an amplification of the optical response from single QDs. A modeling of the photonic crystal in terms of the bandgap, dependent on the characteristics of the crystal itself, has been carried out by the group led by Prof. Massimo Gurioli at UniFi, and indicated a series of values for the lattice constant of the photonic cavity. The cavity types that better accomplish our task are H1, i.e. with a missing hole in the triangular lattice, and H2, i.e. such that in the triangular lattice are missing 7 holes to form a hexagon. Since the properties of the modified H1 cavity vary dramatically even for minor variations (a few nm) in the diameter r0 of the non-displaced holes and of the displaced holes d, cavities with different values of r0 and d were nanofabricated. In total, about 100 photonic cavities were considered in order to cover a wide range of supported modes to match the optical emission mode of a QD. A sample with three QW has been used for the nanofabrication of photonic crystals, using advanced techniques made possible by instrumentation present at the Clean Room of the Laboratory NEST. The cavities were made using electron beam lithography (EBL) through a scanning electron microscope (SEM) and subsequent reactive ion etching (ICP-RIE). Given the extreme proximity of the holes of the cavity (approximately 150nm) and the precision with which it is necessary that they are obtained in terms of size and interstitial distance, different techniques have been tried for EBL to limit the effect near dose inherently generated by exposure of the photoresist to the electron beam. Different positive photoresist were characterized with regard to their response to exposure, such as PMMA 679.02 and 679.04 (Allresist) and ZEP 520-A (Zeonrex). The result is shown in the following figure.